Annotation: Losing her mother to cancer, Rose works through her grief with the help of a survival kit her mother left for her. Plot Summary: A picture of peonies, a crystal heart, an iPod, a paper star, a box of crayons and a tiny handmade kite made up Rose’s Survival Kit – a kit made by her mother before she died in a devastating battle against cancer. Before her mother’s death, Rose was a vibrant girl in the center of the school’s social scene and dating the popular captain of the football them. Now she is a shell of her former self; quitting cheerleading and ending her rocky relationship with her boyfriend. Her only tie to her former life is her best friend, Krupa. 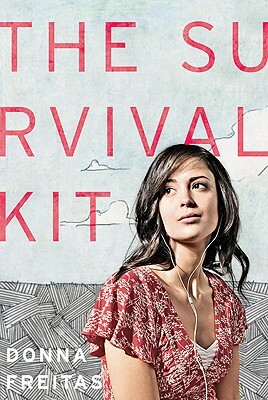 With the discovery of the survival kit, can Rose begin to heal and piece her heart together? Critical Evaluation: With such a difficult subject matter, books on grief and death can easily get bogged down. The Survival Kit never gets to that point. While some of the dialogue could be fixed – there were some points where the dialogue felt formal and wooden – most of it flowed together to craft a moving story on loss. However, the characters or the romance never felt fully fleshed out to me. The protagonist, Rose, is easy to empathize with as she struggles to grieve and move on while holding the family together, especially dealing with her father’s drinking binges. Her grief and reactions felt very powerfully real that it did not seem like a struggle of a character in a novel. Freitas did a good job fleshing out Rose’s character. With so many other books on the subject matter, Freitas’ story does not stand out in the crowd. I felt no connection with the story compared to Nina LaCour’s Hold Still or Jandy Nelson’s The Sky is Everywhere, both books with similar themes that I love and felt deeply for. While The Survival Kit did not find a home in my heart, I am confident that this book will appeal to other readers out there. Challenge Issues: People work through grief in different ways and sometimes reading a book about a character in a similar situation can help that process. Additionally, the VOYA review states “A copy of The Survival Kit would be a worthy addition for a teen coping with her own loss or struggling to help friends or family cope with theirs.” Even highly critical Kirkus has mostly positive things to say about this book.